HOUBLONDE is an authentic beer to be savoured among real friends. Totally natural, she joins the joy of living. 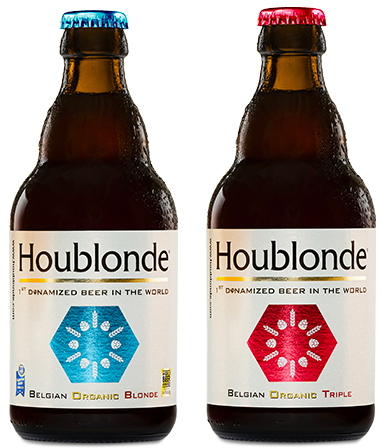 In fact, HOUBLONDE is said to enhance the enjoyment of people just being together. And so say all of us! The tasting of the HOUBLONDE will never be as satisfying as when it takes place in the specially designed glass that reveals all the expression of its aromas. Standing, tall, slender with a tightened collar, the glass “Amber Pokal” reflects all the elegance of the HOUBLONDE beer. But that’s not all because the HOUBLONDE glass also hides its secret. By pouring the beer with mastery, you can admire the swirl of bubbles in its center. A unique process that translates the concept of dynamized water into the glass. Cheers! « Every month, our circle of connoisseurs organises a beer-tasting session. The day I introduced them to HOUBLONDE, there was truly a very special atmosphere. Like someone had cast a spell… » – Donald, 39.